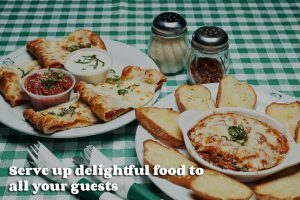 • Serve up delightful food to all your guests – No gluten pizza, gluten-free pasta, and plenty of assorted gluten-free delights are on our menu at Bucceto’s. What this means is that all of your friends and family can gather and enjoy their time together without worry about gluten sensitivities and intolerances. Our Smiling Teeth pizza options come in both gluten and gluten-free versions, each celebrating the same quality of fresh ingredients bursting with flavor. • Get everyone together – Throwing parties at home often limits your guests. You only have so much room, so if you want the whole family there, all your friends, and some co-workers to celebrate with you, you might have to pare down your guest list. Our party venue in Bloomington has an entire private room that may be reserved for guest lists of 20 people or more. • Warm and stress-free – At Bucceto’s, we and our owner Paul Heilbrunn know that a party should be fun…not stressful. We provide a warm and stress-free environment at our West 3rd party venue location, so you’re kept far away from the wind and cold, and close to all of your favorite people while you celebrate your day and enjoy a great meal. • Good for the whole family – Whether you’re trying to figure out something different to do for your little one, or you’re about to reach that big over the hill milestone, our party venue is good for the whole family. Serving up Smiling Teeth or custom pizzas for any palate, as well as pastas and desserts, gives every birthday person and every guest something to love while you all celebrate. 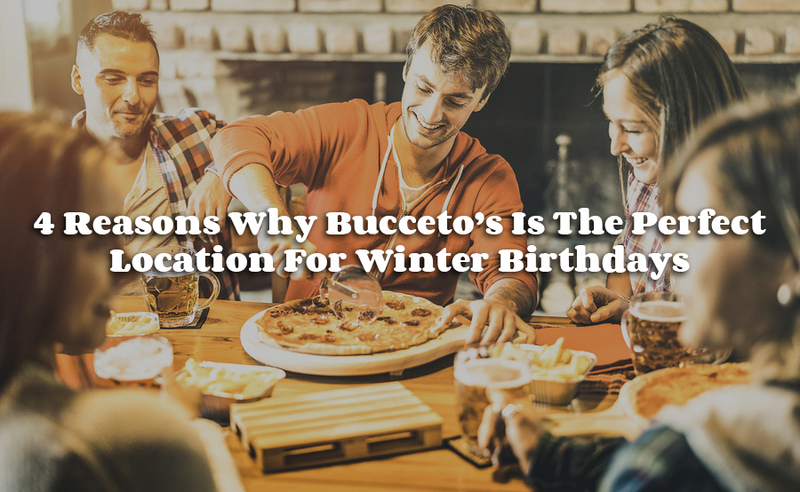 No longer is coming up with fun winter birthday ideas a big deal, and we at Bucceto’s are ready to make your big day the most memorable one possible!